Although Bangalore has quickly developed into a commercial hub, its rich cultural heritage should not be forgotten. Across the city, one can see temples that date back thousands of years. Most of these temples are built in the traditional Dravidian architectural style, though a few exhibit a modern facade. 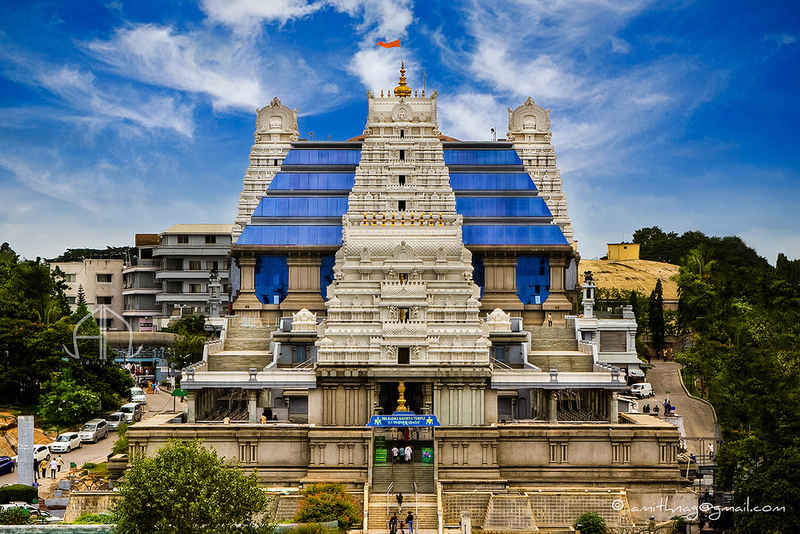 Out of the many temples in Bangalore that you can visit, we have picked the 10 best. It doesn’t matter whether you are religious or just interested in architecture, you surely will have a pleasant experience at any of these temples. Located close to the airport, the Chokkanathaswamy temple is one of the oldest religious structures in Bangalore. Built in the 10th century by the Cholas, the temple is dedicated to Lord Vishnu. The temple is constructed in true Chola style of architecture and has Tamil inscriptions on the pillars. The main highlights at the temple are the large pillars and the beautifully sculpted statues. On one of the pillars of the temple, Lord Vishnu’s dashavatharas (10 forms) are etched. Legend has it that people who come to the temple witnesses a pranic energy flowing through their bodies as they pray. Situated in South Bangalore, the Dodda Basavana Gudi was built by the former ruler of Vijayanagara Empire in 1537. This temple is believed to be the biggest Nandi temples in the world, measuring a whopping 15 feet. The standout feature of the temple is the tall granite statue of a bull (Nandi) that is carved from a single rock. The ambience of the Dodda Basavana Gudi temple lights up on the last Monday and Tuesday of the Hindu month ‘Karthika’, when the Kadalekaye Parishe Festival (groundnut fair) is held. At the fair, devotees offer groundnuts to the deity. You will find this temple in the Dodda Basavana Gudi temple complex. It is popularly called the Shakthi Ganapathi or the Satya Ganapathi temple and has one of the largest monolithic Ganesha statues in Bangalore. The Ganesha idol measures 18 feet in height and 16 feet in width. The best time to visit the temple is during the Ganesha festivities when the statue of Lord Ganesha is adorned in different avatars, the most famous being the Benne Alankara. In this avatar, the Ganesha idol is drenched with 100 kilograms of butter. The Shiva temple in Bangalore is one of the most beautiful temples in India. Inside the temple, you will find gorgeous statues of Lord Shiva and Ganesha. The statue of Lord Shiva stands at 65 feet and sits inside a man-made pool of water that is a replica of Mount Kailash (Shiva’s natural habitat). A popular ritual in the Shiva temple has the temple priests wash the linga with milk and flowers while they offer special prayers. The best time to visit the temple is during Maha Shivratri and Ganesh Chaturthi. One can also visit the temple on a Monday when a special aarthi is held inside the temple. A prime example of Indian rock-cut architecture, the Gavi Gangadareshwara Temple is a cave temple that was built sometime in the 9th century. Legend has it that the temple was actually made from a single rock. The most popular sighting in the temple complex is the stone discs in the forecourt. The temple is also famous for housing a rare idol of the Fire God Agni who has two heads and three legs. The ISKCON temple in Bangalore is one of Vaishnavism’s largest temples in the world. Built in 1997, the structure looks elegant and graceful. The temple is embellished with stone carvings and is built in the neo-classical style. Devotees to the temple are greeted to water fountains and a huge arch at the entrance. Inside the temple, one can find idols of Lord Krishna that are attractively adorned. There are five prayer halls inside the temple, and there is also a complex, where learning sessions about Lord Krishna’s life are conducted. The Venkateshwara Temple is located on the Krishnarajendra Road in Basavanagudi. It was constructed in 1689, making it one of the oldest temples in Bangalore. The temple is a prime example of typical Dravidian and Vijayanagara architectural styles. In the temple, sanctum sits a beautiful statue of Lord Venkataramana. On the walls of the temple, one can see gorgeous carvings of Lord Brahma, Shiva, and Vishnu. The temple sees a lot of visitors daily. While there, do pay attention to the beautiful carvings and inscriptions on the pillars of the temple. The Shrungagiri Shanmukha Temple in Bangalore is built at the site where Lord Shanmukha set up his abode. The sanctum of the temple is constructed using Indian traditional architectural styles and the exterior is built with a design that resembles Lord Shanmukha’s six faces. Inside the temple is large crystal dome that is built above a six-faced Gopuram. The temple towers in the complex are beautifully adorned with crystal stones. One of the popular temples in Bangalore, the Banashankari temple is dedicated to the deity Banashankari Amma. It was constructed in 1915 with a very simple facade. The unique thing about this temple is that the devotees of goddess Banashankari Amma hold special prayers on the Rahukala, which is considered an inauspicious day for most Hindus. Tuesdays, Fridays and Sundays are when the temple is packed to capacity with devotees. Some important festivals celebrated in the temple are the feast day of Goddess Banashankari Amma held on September 13, Dusherra, and the temple anniversary that falls in the Hindu month of Pushya Maasa (December to January of the Roman calendar). Location: Near the Banashankari Bus Stand. The Halasuru Someshwara Temple stands in the cantonment area and is built in the style used during the Vijayanagara dynasty. In the temple complex, one can see quite a few idols of different Hindu gods and goddesses. Here you will also get to see the Navagraha Temple that is believed to hold statues of the twelve rishis. There is a beautiful tall pillar near the entrance gate. The tower of the temple has inscriptions and drawings of figures, animals, and Gods from Hindu Mythology. The open Mantapa on the temple premises exhibits 48 pillars that have carvings of deities. History has it that there once existed a huge temple tank on the premises of the temple. The temple is built in honour of Shri Someshwara Swamy. The next time you are in Bangalore, do leave at least a couple of days to see these 10 temples in the garden city. Your visit will not be complete without them. What are some of the most amazing temples you’ve been to in India? We would love to hear about your experience in the comments section below.